The coup which removed Mugabe from power in November represents a change in leadership in the ruling ZANU-PF party. Mugabe and his wife, the detested “Gucci-Grace”, have been put out to grass while the previous vice president, Mnangagwa and a couple of army generals have been put in power. This has all been arranged by the army. Mugabe has been granted an amnesty for his crimes, including the murder of 10,000 Ndebele civilians in the 80s and the looting of state property, while Mnangagwa, who was sacked by Mugabe only 18 days earlier and fled for his life, is installed in the presidential palace. All this is presented as a constitutional transition rather than a coup. These changes at the top of the ruling clique are the merely superficial expressions of a deep economic and social crisis which has been festering in Zimbabwe for years and which the ruling cabal could no longer control. Zimbabwe’s economic survival has for many years depended on loans and investment from China, however, a number of recent developments have caused the Chinese to refuse to keep pouring loans and investments into what appears to them to be a bottomless bucket. The dire economic situation is illustrated by a few bald statistics. Zimbabwe annually needs 1.8 million tonnes of staple maize to feed its people but in 2014 only 798,000 tonnes were produced. Just how far production has collapses is indicated by the fact that on average 2 million tonnes were produced annually in the period up to 2000. Today the shortage is such that 4 million out of a population of 16 million depend on food aid while 70% of the population is living on less than $1.90 per day. 3 million people have fled the country mostly to neighbouring states. 96% of the economy is now what is classed as the “informal sector” which means that almost the entire economy cannot be taxed and the government spends about 90% of its tax income on paying the civil service and the army. Even so, salaries to the civil service, including teachers, doctors and nurses and even the army are not paid regularly and are often months in arrears. When salaries are not paid police set up road blocks and demand bribes to let people pass. Industrial utilisation has fallen from the low of 57% in 2000 to 15% today, and industrial jobs have fallen from 200,000 to 90,000. The unemployment rate is now over 90%. All this led to a series of strikes in July 2016. At this point some workers had not been paid their wages for 15 months. These strikes culminated in a general strike on 7 July but the police and army remained loyal and, after a number of battles with the police, the strike was ended and the regime survived. Today these problems have been aggravated by a currency crisis in which the country is running out of dollars. It attempted to alleviate the currency shortage by introducing a parallel currency which they called “Bond Notes”. These were supposed to be equal to dollars and people were forced to accept them when they withdrew dollar savings from the banks. These “Bond Notes” have already lost 80% of their value which in turn has stoked fears of a return of the hyperinflation of 2008 and people are hoarding dollars, making the crisis worse. In addition the regime, including the army, is riddled with corruption. Mugabe and top ZANU officials hold extensive properties in Zimbabwe and overseas. The enormous wealth of General Chiwenga, who orchestrated the coup, has been revealed in the vast claims his wife is making on his estate in his recent divorce case. Clearly the general has also had his snout in the trough. Mugabe himself admitted that $13bn had been looted from the Marange diamond fields, a lot of this by the army. His admission presumably means that he did not share in the loot, but while a quarter of the population was on the brink of starvation Mugabe himself did not scruple to spend $1 million on his 92nd birthday party! However, while the regime’s Chinese backers could live with a certain level of corruption and incompetence, it appears that recent developments have simply gone too far. In particular, two measures the regime introduced have alienated them. The first was the indigenisation policy which came into force in 2010 and required all companies with assets greater than $500,000 to have over 50% black Zimbabwean ownership. This meant companies pulling out of the country or handing over half their capital. The second was the import restriction law which came into effect, with various revisions, in 2016 and was an attempt to stem the outflow of dollars caused by the $3bn annual trade deficit. Both measures affected Chinese companies. During the beginning of the currency crisis in 2016 Mugabe turned to the Chinese asking for further loans. The Chinese who had already forgiven $40 million of Zimbabwe debt refused. In the week before the coup general Chiwenga was in China on a series of high level meetings and it appears likely that the Chinese approved the ousting of Mugabe. Wang Hongyi, an associate research fellow at the Institute of West-Asian and African Studies gives an indication of Chinese thinking. Writing in the Chinese state media tabloid Global Times, he said concerns had begun to grow over the long-term safety of Beijing's investment in its Zimbabwean partner. 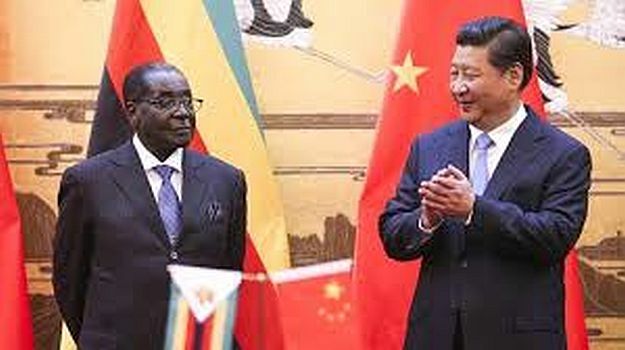 “Chinese investment in Zimbabwe has also fallen victim to Mugabe's policy and some projects were forced to close down or move to other countries in recent years, bringing huge losses. Bilateral cooperation did not realize its potential under Mugabe's rule." Wang concluded that a change of government could be beneficial to China-Zimbabwe relations, but that "Friendly ties will embrace new development opportunities." When their Chinese ally failed to rescue them the regime turned again to the western financial institutions. Mnangagwa was actually the person involved in this and was negotiating a restructuring of the existing debts of $9bn and the $1.8bn arrears in 2016. The World Bank, however, insisted the country pay off its arrears before any fresh loans were granted and introduce economic reforms such as privatisation of state assets and liberalisation. The efforts to re-engage with western financial institutions were recently scuppered by Mugabe which has left the regime unable to borrow and in its present cul-de-sac. It now seems likely that the new leadership will return to western finance agencies. The so-called national liberation has meant precisely the liberation of the black bourgeoisie. And this liberation consists in prostrating the country at the feet of one imperialist bloc then another. For the working class “liberation” has meant unemployment or brutal exploitation enforced by police and military repression or, for millions, emigration. It is significant that the working class played no part in the recent charades which brought about the change in leadership. In the early years of Mugabe’s rule he placed the country in the orbit of western imperialism despite ZANU being a liberation movement supported by the Chinese. He attempted to heal the wounds of the liberation war, and regenerate the economy by accommodation with the previous white regime. White farmers were guaranteed their farms and there were even white politicians in Mugabe’s cabinet. During the 80s Zimbabwe’s economic growth averaged 4%. These years, however, saw a power struggle with the rival liberation movement ZAPU (Zimbabwe African People’s Union), which was supported by Russian imperialism. After a massacre of ZAPU supporters, a merger of sorts was arranged in 1987 producing ZANU-PF. The merged movement was dominated by ZANU and remained committed to state capitalist measures in regard to the economy which led to conflicts with western financial institutions when the country started to borrow in the early 90s. Loans from the IMF and World Bank in 1991 came with Structural Adjustment Programmes (SAPs). The IMF’s SAP for Zimbabwe required reducing trade tariffs and import duties, eliminating foreign currency controls, removing protections for the manufacturing sector, deregulating the labour market, lowering the minimum wage, ending employment security, cutting the fiscal deficit, reducing the tax rate and deregulating financial markets. Initially the country implemented these measures, however, they brought “massive closures of companies,” leading to increased poverty and unemployment. 25% of public workers were laid off and unemployment reached between 35% and 50% in 1997. By 1999, 68% of the population was living on less than $2 a day and with the collapse of wages many workers lived far below the poverty line. In 1999 Zimbabwe stopped implementing the SAPs and stopped paying capital and interest to the IMF/World Bank. The country was immediately ostracised by western finance organisations. To make matters worse, the Zimbabwean army had been sent into the Democratic Republic of the Congo in 1998 in a very costly operation which the regime hoped would pay for itself through looting. The problem with western lenders was also a factor in the seizures of white owned farms which started in 2000. All this reduced Zimbabwe to the status of a pariah country starved of finance and subject to sanctions. As a result the country has not been able to borrow from western financial organisations since 1999. In desperation the country turned to China for help. The Chinese have been happy to invest in Zimbabwe and advance loans as it is potentially a very rich country containing minerals which they want such as platinum, chromium, magnesium, antimony, cobalt and gold. A policy baptised with the name of “Look East” was instituted in 2003. Initially this policy bore fruit. China became Zimbabwe’s largest trading partner and advanced interest free loans and built schools, hospitals, sports facilities as well as textile and cement factories and helped in the development of steel manufacturing. By 2015 Chinese annual investment was $450 million which represented over half the total foreign investment in the country. However, though support from China prevented economic collapse it was not sufficient to rescue Zimbabwe from its pariah status. Shortage of foreign exchange and the global crisis of 2007/08 led the regime to start devaluing its currency. The hyperinflation this produced is legendary. It was worse than the inflation of Weimar Germany in 1923. By 2009 the Zimbabwean $ was valueless and the regime gave up issuing it and made the US $ the currency of the country. At this point the exchange rate was 1 US $ = 35 quintillion Zimbabwe dollars (i.e. 35 x 10 to the power 15)! The use of the $ as the de facto currency has, of course, led to further problems as mentioned above. Since China was not prepared to cough up a turn to western financial organisations was necessary. The central bank governor, Manguda, added Zimbabwe has become uncompetitive as $ had risen against local currencies. The country needs to devalue 20%. As it cannot control its currency it needs to reduce wages by 20%. The regime appears to be crawling back to an accommodation with western finance and because Mugabe stood in the way of this he had to go. The western financial institutions are bound to demand a very high price for this, a price which will be loaded onto the shoulders of the Zimbabwean working class. Zimbabwe’s attempt to tack between competing imperialist centres illustrates how today, with the increasing globalisation of capital, the national state is national only in the sense that it is dominated by the bourgeoisie of a certain nationality. Its ability to act independently is severely limited. In its key aspects the national state exists as an agent of capital and the imperialist alliances in which it finds itself. Zimbabwe, for example, as part of its subjection to China, became one of the few states to recognise China’s territorial claim to the entire South China Sea. For their part the Chinese have learned from the enormous losses they incurred in Libya by sticking with Gaddafi that it may be more sensible to abandon an autocrat like Mugabe rather than lose everything when he falls. They hope Mnangagwa will rescue the situation for them and perhaps become the Deng Xiaoping of Zimbabwe. Economic engagement is leading to political engagement and political engagement is leading to military engagement. China now has 2000 soldiers in Africa, as part of UN peace keeping operations, the majority in South Sudan whose job is to keep the Chinese oil wells flowing. It has also recently established a permanent military base at Djibouti in the horn of Africa. The US, of course, has a massively greater military presence which could in future be used to oppose Chinese advances. The US has military bases in 49 of Africa’s 54 countries. For further discussion of this see “The Hidden Scramble for Africa’s Resources” on our website. There are at present 1 million Chinese in Africa and 10,000 of these are in Zimbabwe. Only a third of this number are temporary workers on Chinese projects working on fixed contracts of 1 to 3 years. They are mostly skilled workers. The rest are petty bourgeois, shopkeepers, small scale traders or small scale manufacturers. The majority of unskilled labour on Chinese projects is African. It is, however, a complete illusion to imagine that the Chinese treat workers any better than western capitalists. Chinese projects in Africa simply reproduce the class struggle between labour and capital. Some of the largest contracts have seen violent strikes. On the $4bn Mombasa to Nairobi railway project where 90% of the labour is African one of the managers, Mr Lu described his experience of a strike. Chinese capital, just like western capital, is looking for wage labour to exploit and trying to find the most efficient means of squeezing surplus value out of its workers. After 37 years in power ZANU stands clearly exposed as a bourgeois political force implacably hostile to the working class. Exactly the same can be said about the ANC in South Africa. It is now also clear what a serious political mistake it was for the working class to support these nationalist movements. As we have reported above, in Zimbabwe the material conditions of the working class are today significantly worse than they were at the time of so-called liberation, but more importantly there is great confusion amongst workers about what has happened and the way forward. Many workers see Mugabe as a traitor but still retain faith in ZANU-PF. Others think that the opposition parties will make their lives better. The truth is that Mugabe and ZANU never intended liberation for the working class. Liberation was for the aspiring black bourgeois class whose representative Mugabe was. The various opposition movements which now exist, like the Movement for Democratic Change (MDF) simply represent other factions of the bourgeoisie who think they could run Zimbabwean capitalism and its relationship with global capital better than ZANU-PF. All factions assume exploitation of workers will continue and profits come before any considerations of workers interests. Workers have been misled to identify their interests with one or other faction of the bourgeoisie and are paying a terrible price for this. These events also expose the Stalinists and Trotskyists, who have consistently urged workers to enlist as the infantry for the nationalist struggle. Their actions show they are merely left wing political forces of capital. Today they cannot possibly explain how support for the nationalists has benefited the working class. They pretended Mugabe was a Marxist and his plans for nationalisation and state control were some type of socialism, all of which is today exposed as complete nonsense. AS Rosa Luxemburg argued before World War One, in the epoch of imperialism national liberation stands opposed to working class liberation. In today’s world of globalised capital this is more clearly the case than ever before. 100 years of history have proved how correct her judgement was. Workers need to fight for their own interests against all factions of the Zimbabwean bourgeoisie and their international masters whether Chinese, US or European. If the national struggle had been recognised for what it was, namely a bourgeois struggle, and workers had maintained their own independent political organisation this would be much easier today. It needs to be said loud and clear that the nationalists are deadly enemies of the working class. Future strikes and demonstrations must be aimed at improving the conditions of the working class and ignore the siren calls of the national interest. Workers need to unite and fight for their own interests. A first step in this direction would be to unite the struggles of African and Chinese workers where they are working together on Chinese projects. Ultimately workers struggles worldwide need to be united and directed to the overthrow of capitalist social relations and the establishment of a truly communist world.